So you’ve got an answer in someone’s report that needs to be followed up on later. Maybe you’ve promised your team member a quick meeting the following week or you just want to catch up and see how they’re doing on that particular answer. But… you forgot you marked that answer. Not to fear! 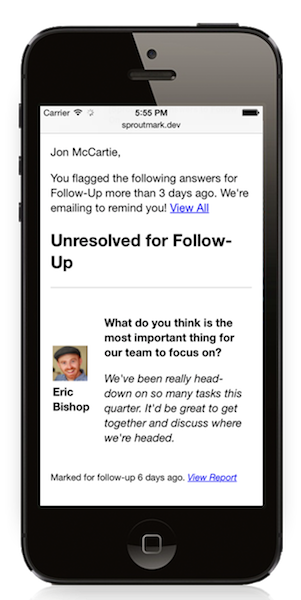 We’ve beefed up our notification system a bit and now you can get an email reminder on any old follow-ups that haven’t been resolved. We’ve got this turned on by default for you, but you can always adjust your notification settings by editing your profile.